Christopher Eccleston has revealed that his forthcoming role in iconic children’s animation Danger Mouse means as much to him as playing Macbeth at the RSC. 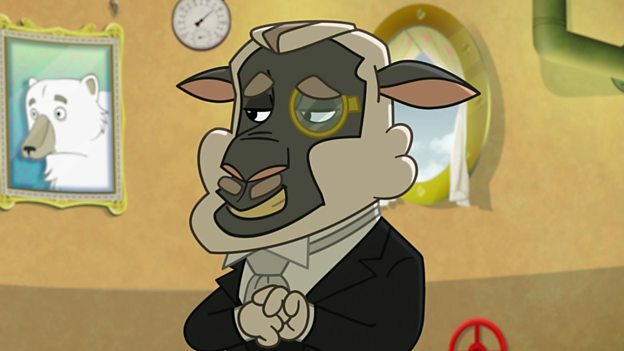 The Emmy winning and Bafta nominated Eccleston, one of the UK’s leading actors, plays the dastardly J Woolington Sham in No More Mr Ice Guy, an episode from the hilarious action-packed new series of Danger Mouse broadcast on CBBC on Monday 1 October at 6pm. “Listen, I’m playing Macbeth at the RSC at the moment. Danger Mouse is just as important to me - and I’m not kidding!” Eccleston said as he revealed himself at the voice record to be a long-time fan of the show. His character, J Woolington Sham, at first seems like a nice, gentlemanly teashop owner who befriends a dejected Penfold when he is usurped as Danger Mouse’s sidekick by The Snowman. He offers Penfold a new job at the teashop and at first things go splendidly - but trouble is soon brewing when Sham, along with the sinister Snowman, begins to show his true colours. The star-studded cast also includes fellow special guest Richard Ayoade as The Snowman along with regulars Alexander Armstrong (Danger Mouse), Kevin Eldon (Penfold) and Stephen Fry (Colonel K). Eccleston’s other leading roles include The Ninth Doctor in the relaunch of Doctor Who, plus Shakespearian heavyweights Macbeth and Hamlet. Danger Mouse burst back on to CBBC in 2015. The high-octane comedy animation follows the adventures of the eponymous secret agent and his ever-faithful sidekick Penfold as they engage in all manner of mind-blowing missions aided, abetted and aggravated by a menagerie of old and new allies and adversaries. The second series of Danger Mouse returned to CBBC screens this year, with a third series currently in production.